Big insurers like United Healthcare (UNH), WellPoint (WLP), and Aetna (AET) face big changes this year; here are 2 things investors should watch in 2014. Shares in the largest health care insurers including United Healthcare (NYSE:UNH), WellPoint (NYSE:ANTM), and Aetna (NYSE:AET) have shrugged off concerns health care reform will derail earnings. All three are trading either at or near new highs. Given the industry's performance since the launch of health care.gov, and considering that Obamacare membership growth may increase each company's operating costs, investors in insurance companies are going to want to watch both operating margin and net income trends closely this year. Insurers operate in a razor thin margin industry. That means every dollar they can cut in costs for caring for patients, paying salaries, or operating their buildings is important to the bottom line. That cost consciousness will become even more important as insurers begin paying claims for newly insured patients with pre-existing conditions. 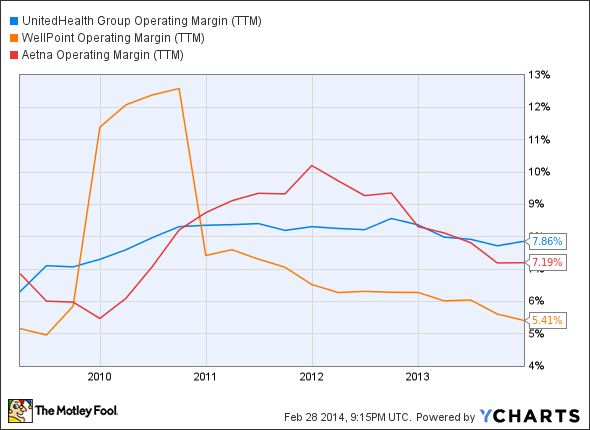 Across these three insurers, United's (NYSE:UNH) 7.8% operating margin is the best and most consistent over the past five years. Operating margin at Aetna (NYSE:AET) has fallen from more than 10% in 2012 to 7.2%, and WellPoint's (NYSE:ANTM) operating margin has trended lower every year since 2010. While the declining operating margin at WellPoint (NYSE:ANTM) and Aetna (NYSE:AET) is concerning, it doesn't mean the two won't be able to grow earnings as membership climbs. It simply suggests United (NYSE:UNH) may be better positioned, operationally, to capitalize on the new revenue opportunity. That suggests that investors shouldn't simply focus on margin in relation to peers, but in relation to historical trends too. If operating margin remains roughly in check this year, all three should see earnings grow -- not shrink -- in the next year thanks membership growth. All three of these companies are seeing membership climb as aging baby boomers sign up for Medicare Advantage, Medicaid expands in many states, and Obamacare boosts demand for private plans. So far, Medicare Advantage and Medicaid are having the biggest impact of the three on membership growth. At United (NYSE:UNH), total membership in Medicare Advantage grew by 425,000 people. United (NYSE:UNH) also added 205,000 new Medicaid members. WellPoint's (NYSE:ANTM) Medicare membership was flat sequentially in the fourth quarter, but Medicaid membership grew by 1.3%. And at Aetna (NYSE:AET), the company is guiding that it will add 110,000 new Medicare Advantage in the first quarter of this year. Aetna's Medicaid membership jumped from 1.2 million to 2 million last year thanks to its acquisition of Coventry Health. That membership growth is helping boost sales at all three companies. At United (NYSE:UNH), sales grew 11% to $122 billion last year. WellPoint's (NYSE:ANTM) sales were up 16% to $70 billion, and Aetna's (NYSE:AET) grew from $36 billion to $47 billion following the Coventry deal. As a result of revenue growth, investors should also track each company's net income trends over the next year. Instead of focusing on quarterly net income, which can be lumpy, investors ought to consider the trailing 12 month net income trend, because it smooths out seasonality, and one-time events that can skew investor opinion. 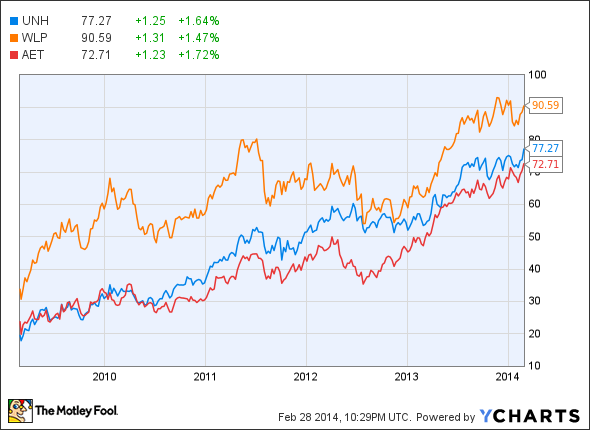 Of these three large insurers, United (NYSE:UNH) appears on the most solid ground by this measure too. 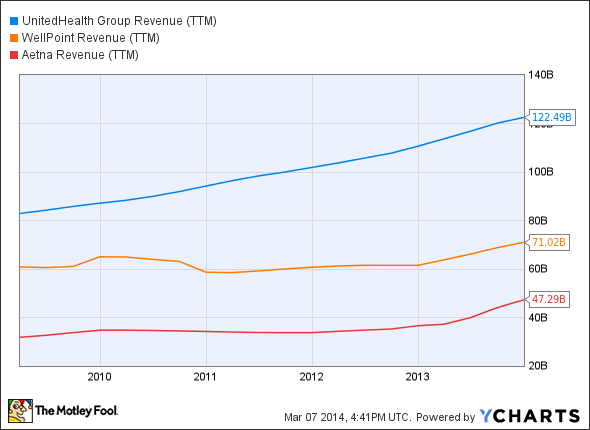 United (NYSE:UNH) has grown its trailing 12 month net income consistently over the past five years. 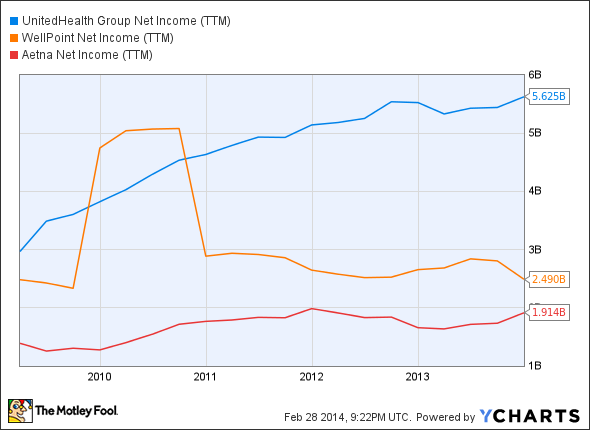 WellPoint's (NYSE:ANTM) net income has been under the most pressure, while Aetna's (NYSE:AET) is rebounding back to 2012 levels. The insurance industry will be an intriguing area for investors to watch this year given the adjustments that will need to be made to navigate the regulatory changes. Thanks to millions of additional premium payers, there's a significant opportunity to boost earnings. However, doing so will require these insurers to control provider costs, reduce patient reliance on high cost providers like hospitals, and avoid the risk of over-hiring those responsible for addressing patient questions and claims. By tracking operating margin and net income trends, Fools should be better able to see whether these companies are more or less likely to make their earnings targets this year.